Info "How many balls can you drop in the break?" Pool Break is a souvenir in the Toys folder of WarioWare: Twisted!. It features a standard billiard table over a simple blue background, with the nine billiard balls being set up as a game of nine-ball. 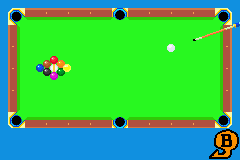 The player controls a pool cue with a cue ball in front of it, and the ball can be struck in any direction, ricocheting off of the walls and other billiard balls. If a ball enters one of the six pockets, it appears at the bottom of the screen and is removed from play. After all of the balls stop moving, the number of balls that were pocketed appears, and everything is reset, though with the cue ball now in a slightly different position than before. This page was last edited on January 20, 2018, at 14:37.